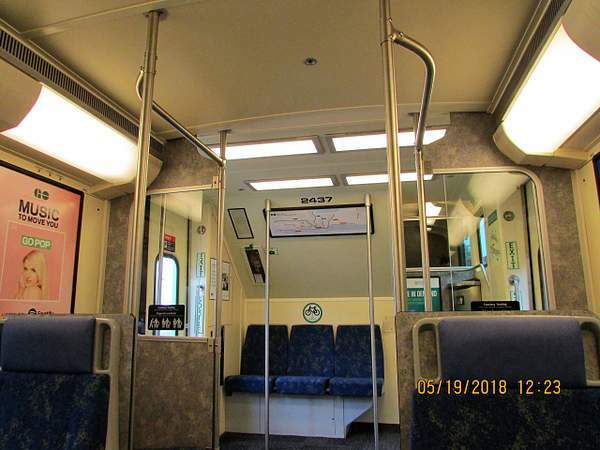 On an eastbound train at Clarkson Road Mile 16 Lakeshore West line. 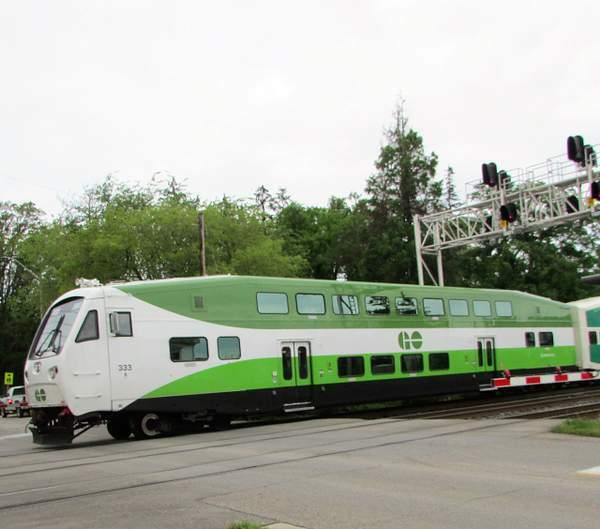 Most of this style of cab cars have been converted to coaches. 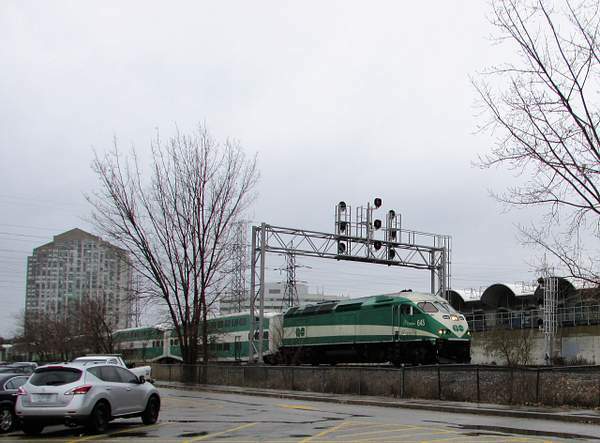 Cab car 301 leads a west bound train into LISGAR a station in on the Milton Line in northwest Mississauga. 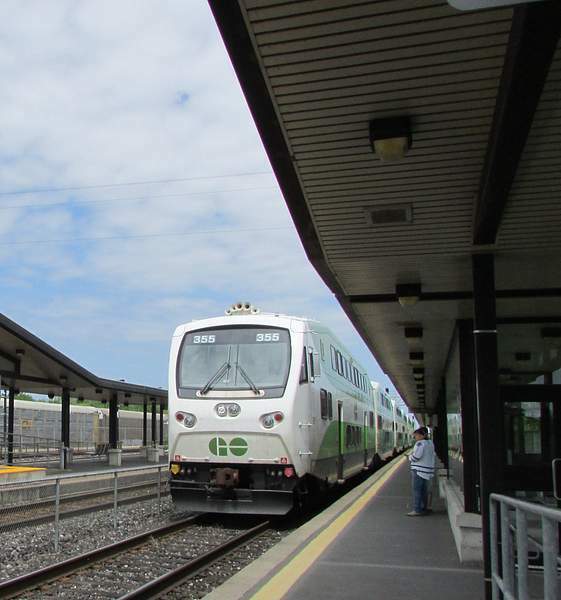 The next and last stop on this line for the train is Milton. 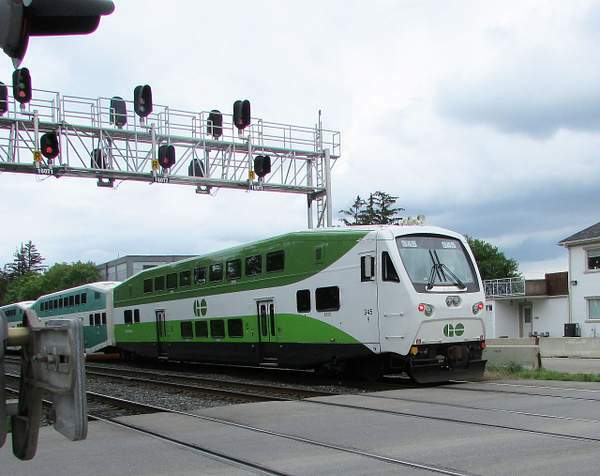 CC 333 leads a westbound train over the Clarkson Road level crossing at Mile 16 on the Oakville Sub. 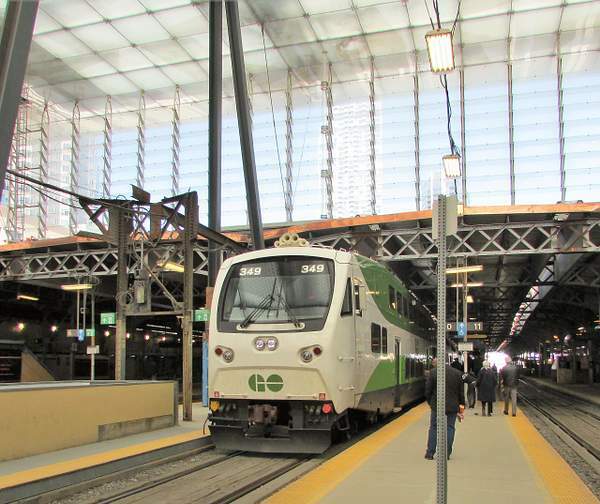 Pulls into the glassed in train shed at Toronto Union to take the 16:13 all stops train to Aldershot. 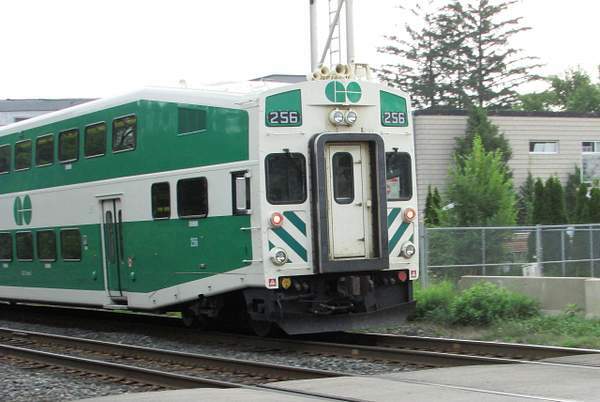 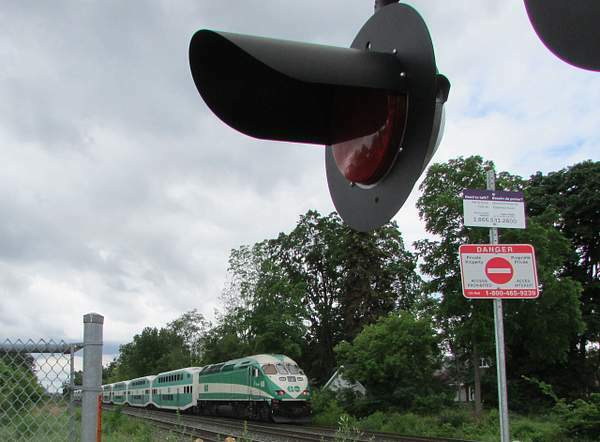 Just meters from the End of Track cab car leads a GO train into Aldershot. 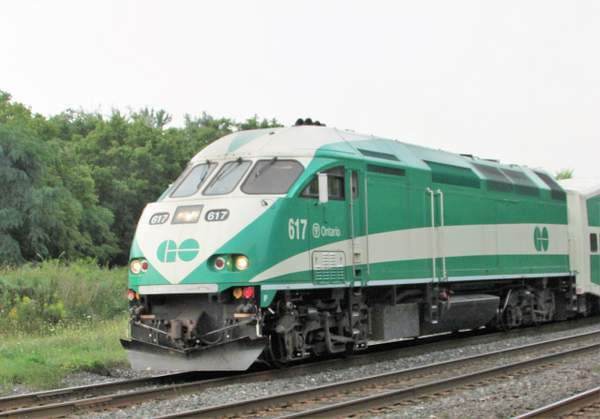 It will sit for nine minutes and then head east All Stops to Toronto and then All Stops to Oshawa. 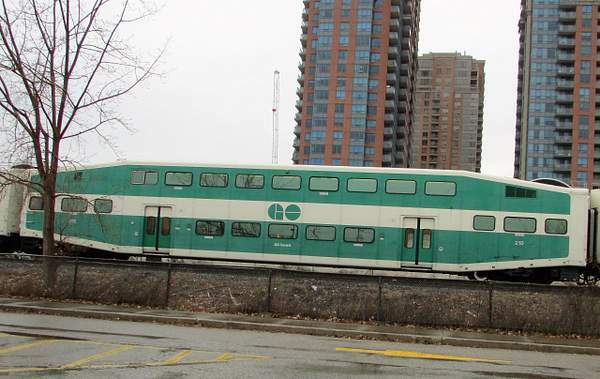 A "cab car" converted to coach; seen passing Kipling GO station but on a Lakeshore West detour. 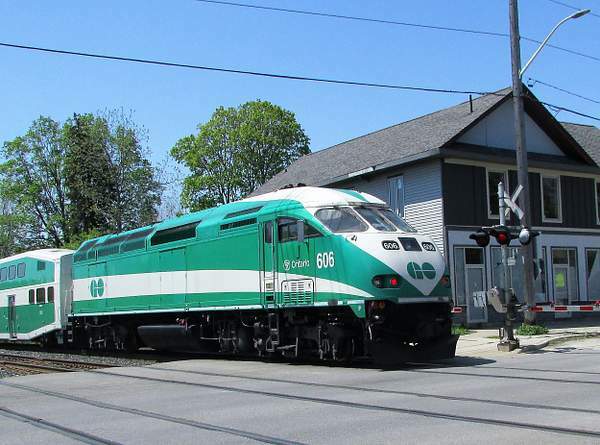 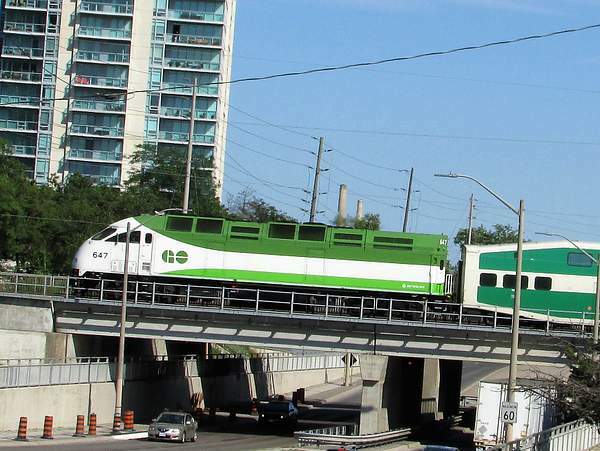 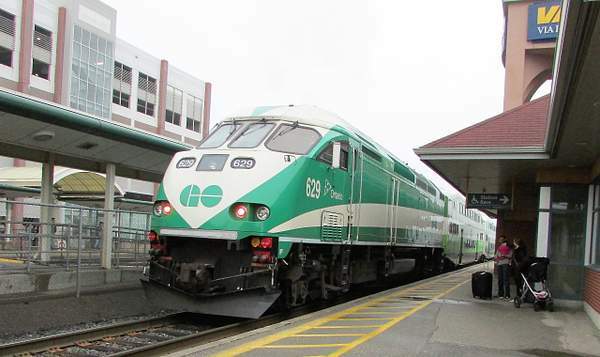 GO 613 pushes an afternoon westbound train into Cooksville GO station and is crossing the Hurontario Street overpass. 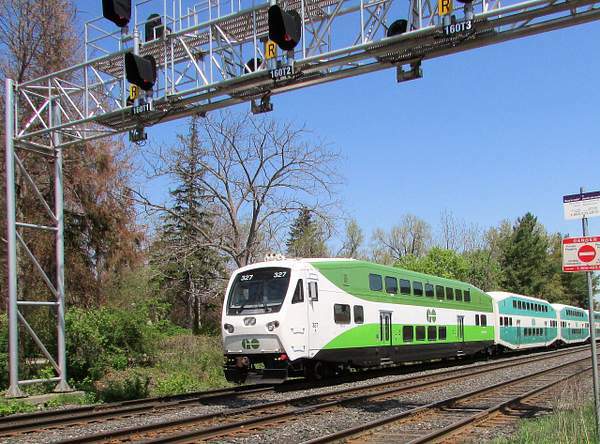 This is GO's MILTON line which runs 31 miles from Toronto to Milton over the CP Galt http:// This overpass will likely be removed when the Hurontario LRT line is built over the next few years. Pulling eastbound train at Mile 16 Lakeshore West line. 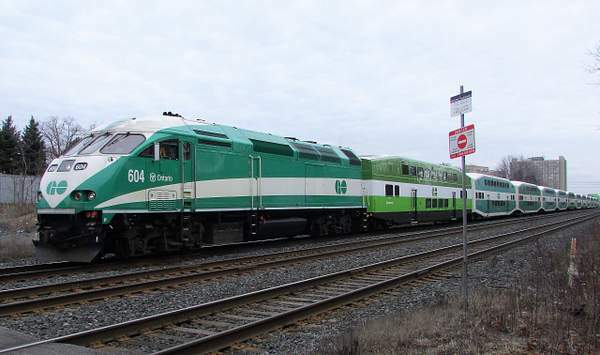 Pulling East at Mile 16 Lakeshore West Line. 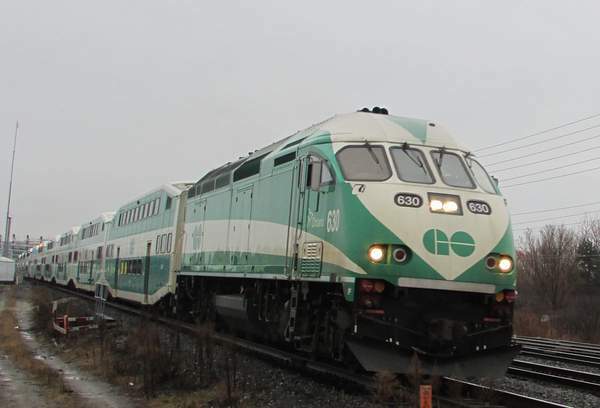 Has just left Clarkson GO station with eastbound train. 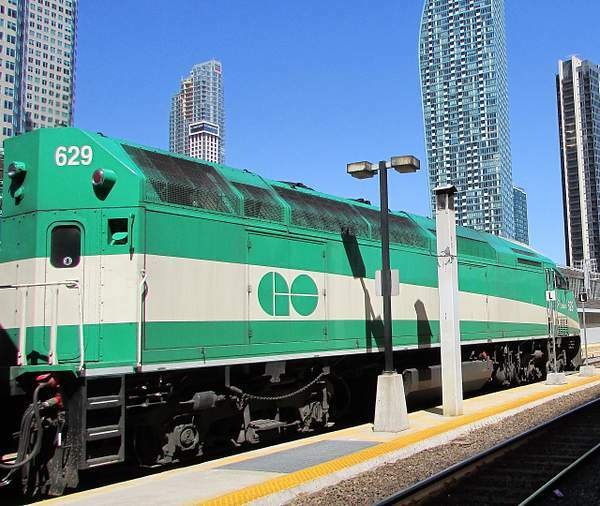 Sitting at platform 26 at Toronto Union Station. 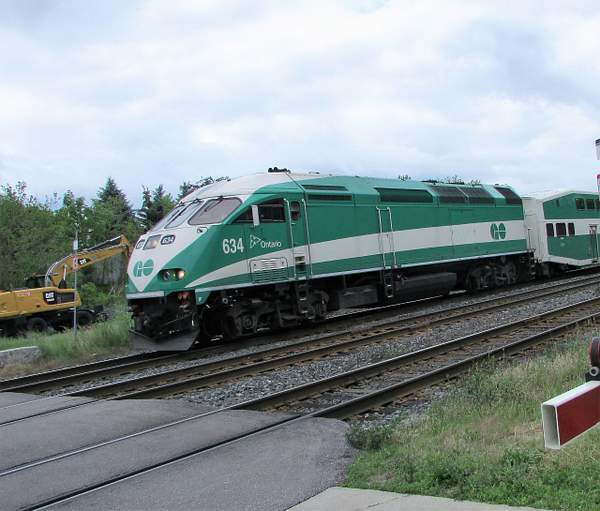 GO 634 pulls train east from Clarkson. 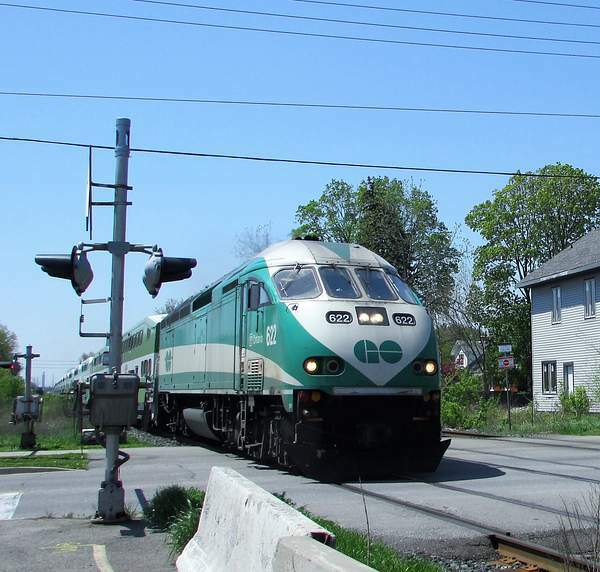 Aldershot is the regular western end of the Lakeshore West line. 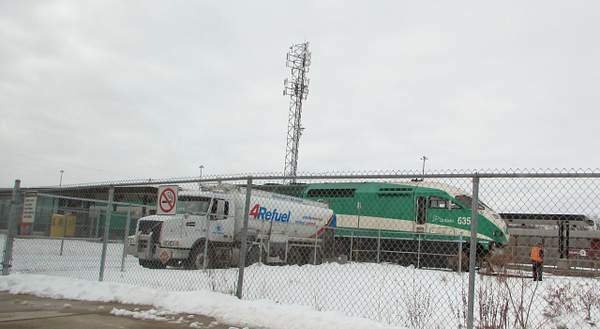 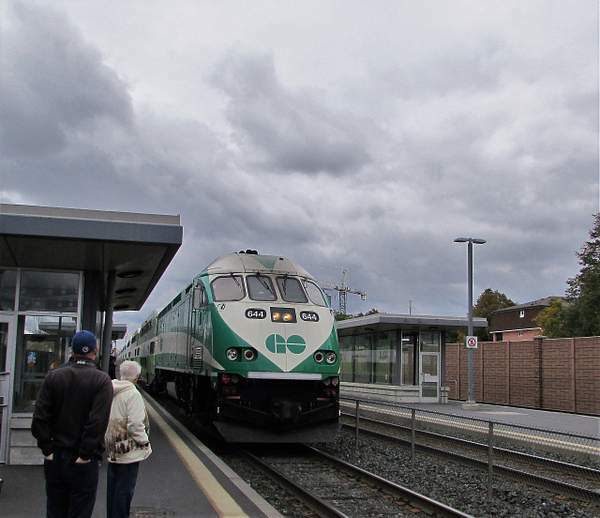 GO trains sit in the station long enough for their diesel fuel tanks to be topped up before heading east. 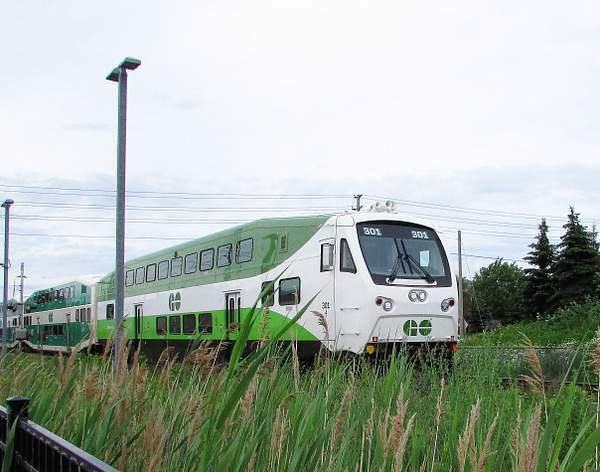 GO 645 leads a detour train off the Canpa Connector onto the CP Galt sub at Kipling. 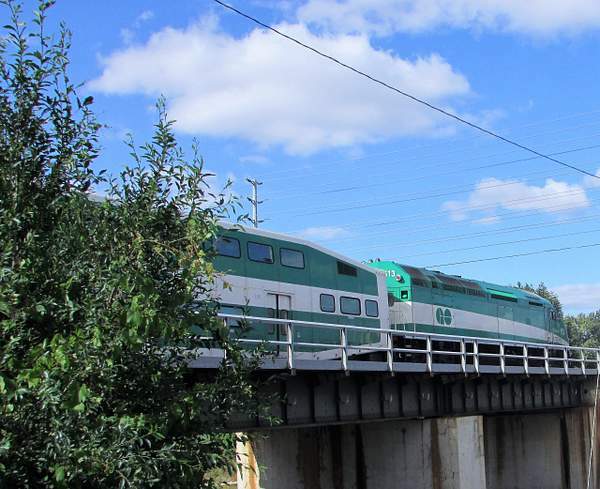 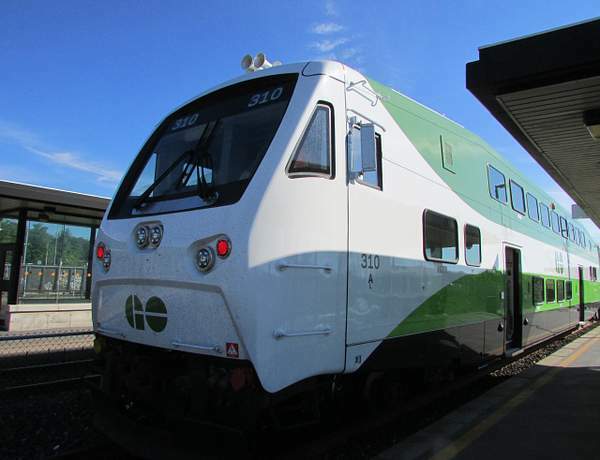 The trains were detouring around the Humber River Bridge replacement project. 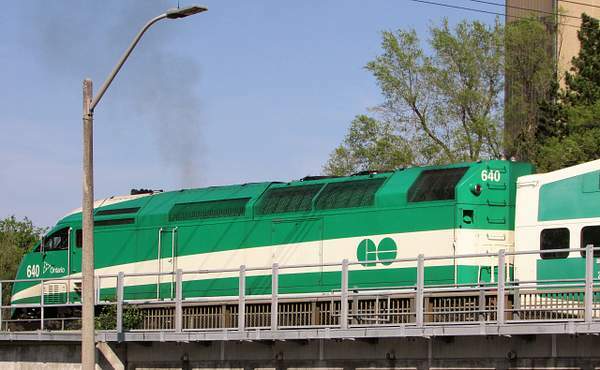 First Tier IV emission compliant locomotive. 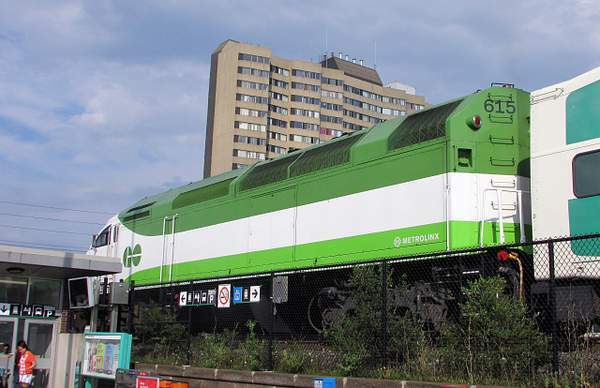 Retrofitted to be powered by a Cummins power plant. 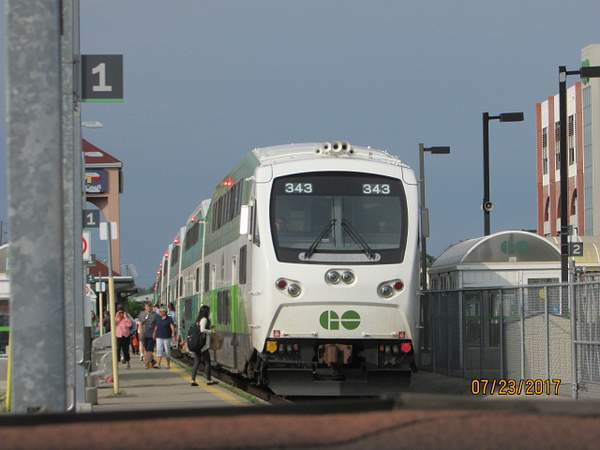 Pushing a Westbound train about to stop at Clarkson GO station. 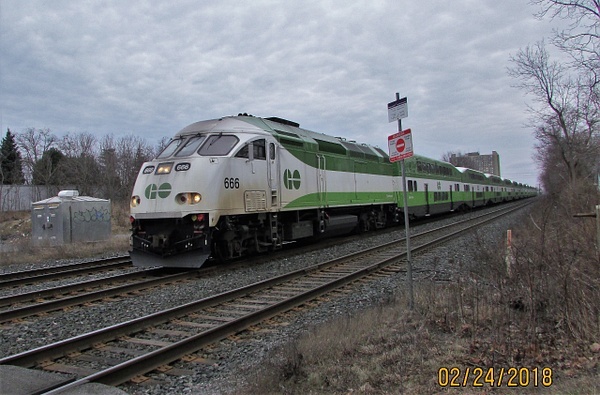 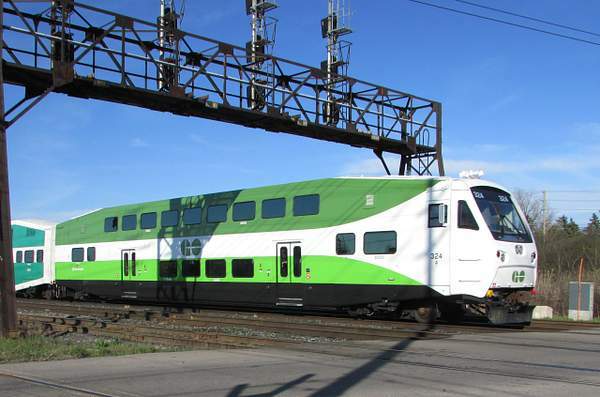 Deadhead train eastbound at mile 16 LSW line (former CN Oakville Sub) with matched Metrolinx train.